If you’re wondering how to help an elderly person get out of a chair, it helps if you keep in mind a few things first. This blog post will explain some of the principles and offer suggestions that some caregivers and individuals have found very useful. The first thing to keep in mind if someone needs help getting out of a chair is that positioning is everything. If a person is not in the right position, it’s going to be a lot harder for them to stand up or for you to help them. For instance, if you’re sitting too far back in the chair, or, if the chair is too low, it’s going to be more of a challenge to get out of that chair. But when you position yourself near the front of the chair it becomes a lot easier to get out of it. Sitting near the front of the chair is just the starting position. It’s important that you help them maintain the best position through-out the whole movement until they are completely and safely standing (this blog post will touch on those positions). Along with being in and maintaining the proper position, its just as important that you understand and encourage them to push in the proper direction. Who hasn’t tried to help someone stand up only to have them push backward and pull you into the chair with them. This is more common than you would believe. But its an easy fix when you understand that they are “pushing” in the wrong and opposite direction that they need to. So, positioning and pushing are the main ideas that are covered in this blog post and will help family caregivers and others understand how to help those who need assistance getting out of a chair. Note: The photos below do not show a walker or other device. 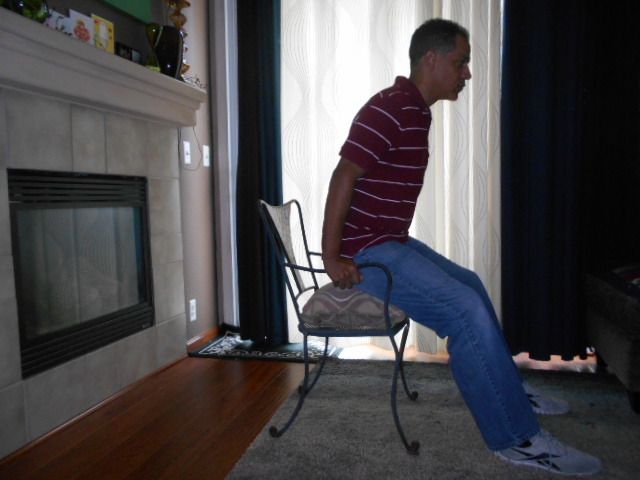 This is only to demonstrate the body mechanics of going from sit to stand from a chair. 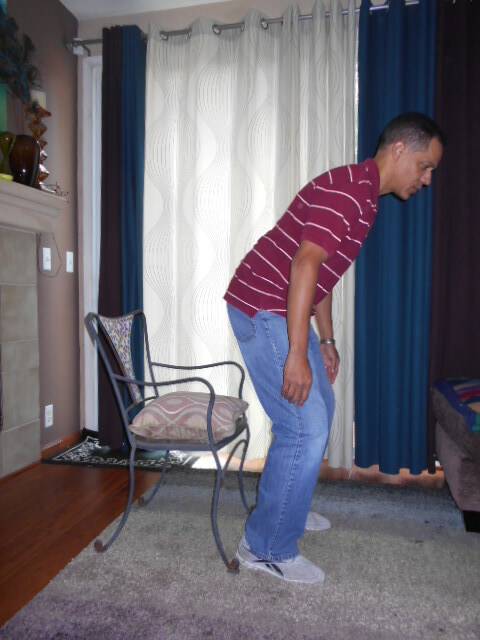 If your loved one typically uses a walker or other device, it should be in front of them when they are doing this. 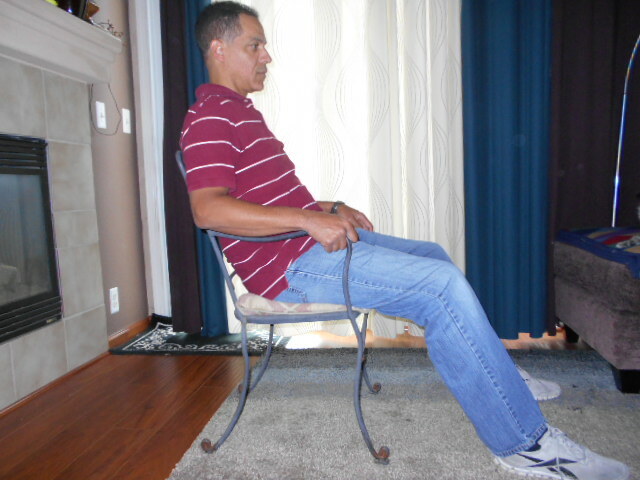 Don’t try to get someone out of a chair if they are sitting like this (below). While leaning the shoulders forward over the knees your loved one should be gazing downward, not forward or up. 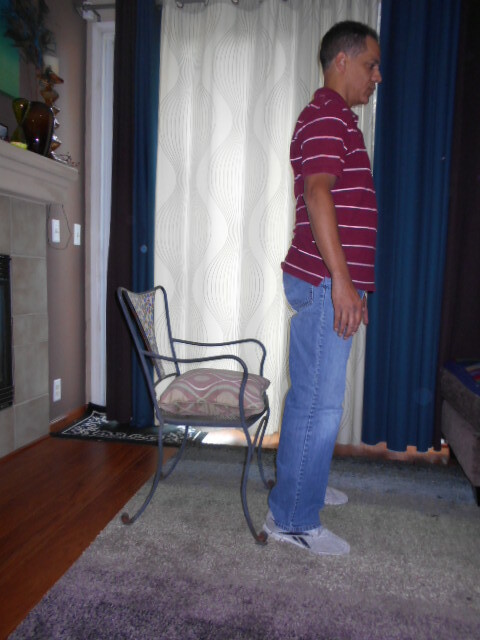 This position is the normal position that people have used since the dawn of time to stand up from a sitting position. 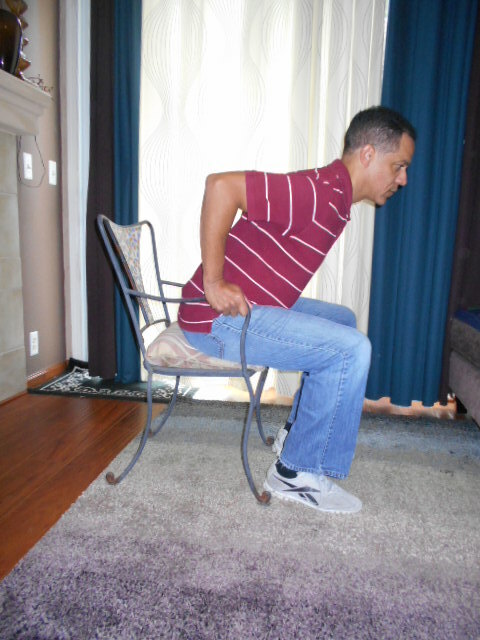 For practical understanding, try to stand up from a chair while at the same time leaning backwards. It’s important to note that the person should still be looking down toward the ground during this step. It’s when a person tries to straighten up and look forward/up before they are balanced on their feet, that pulls them backward to the chair and gives the impression that they are “weak” or “can’t stand up”. The following is what some people try to do and its never successful. Some try to push themselves straight up out of a chair like a rocket with their feet far ahead of their knees. Again, the reason they cannot stand is not because they’re weak. It’s because they are in the wrong position and pushing in the wrong direction. At this point, they have to let go of the chair and shift their body weight to the front of their feet rather than their heels. 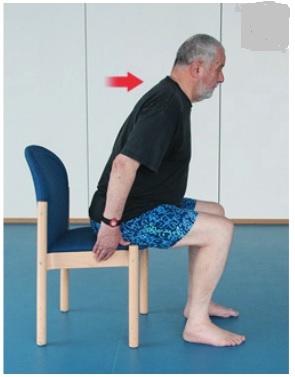 Note: If they continue to hold onto the arms of the chair, their body weight will be distributed backwards to the rear and again, they will feel they “can’t stand up”. But in truth, no one could. Try standing up while your hands are still in contact with the arms of the chair to see this for yourself. It’s only when the body weight is shifted to the front of the feet that the person should try to straighten up and stand upright. This is the point that the person is balanced. As was stated above, it’s good if the person uses a walker, to have it in front of them so that they can support themselves. Understanding these principles and techniques will enable a family caregiver or others to help an elderly person or anyone out of a chair.